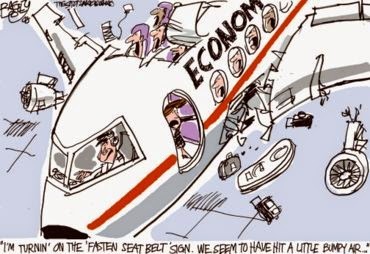 The goods-based economy in the US, largely dependent on the previously irrepressible but now strung-out American consumer, isn’t doing so well. To what extent things have deteriorated shows up in the freight data. 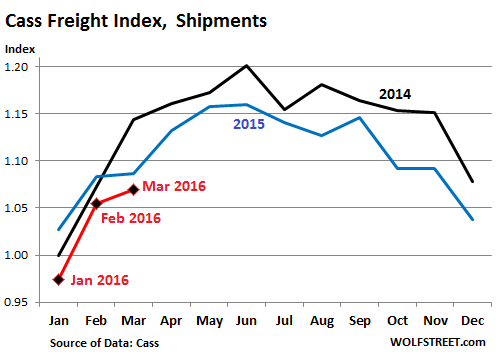 Freight shipments in March fell 1.5% in terms of volume from the already terribly low levels of March 2015, according to the Cass Freight Index. It has been an awful year so far. The index hit the lowest level for any March since 2010. This followed the worst February since 2011 and the worst January since 2010. This is not a blip. On an average basis, volume in the first quarter fell 3.0% from the same period in 2015: the worst first quarter since 2010! The Cass Freight Index tracks freight transactions by “hundreds of large shippers,” regardless of mode of transportation, including by truck and rail. It does not cover bulk commodities, such as oil and coal; so the mayhem taking place in those spaces is not reflected in the index. Instead, the index is focused on consumer packaged goods, food, automotive, chemical, OEM, heavy equipment, and retail. 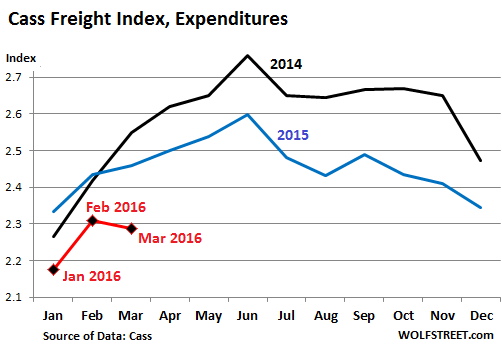 To view the same issue from a dollar perspective: The Cass index for freight expenditures, which tracks the money spent on shipping products, plunged 7% in March from a year ago, on a combination of lower volumes and lower shipping rates. The worst March since 2011! On an average basis, it was the worst first quarter since 2011. 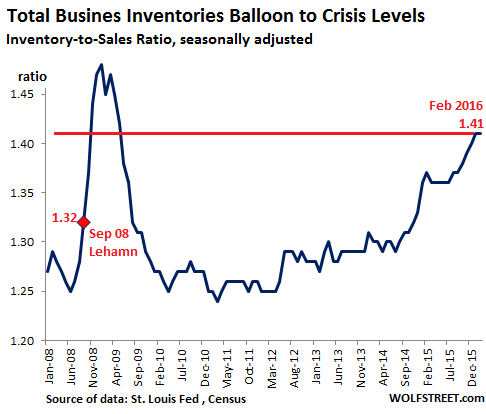 The report blamed part of the debacle on “high inventories,” which are “still a concern.” In fact, it’s the worst inventory glut since the peak of the Financial Crisis. Inventories represent prior sales by suppliers. When companies try to reduce their inventories, they cut their orders. Suppliers see these orders as sales. As their sales slump, suppliers adjust by cutting their own orders, thus causing the sales slump to propagate up the supply chain [read… Why This Economy Is Now Running Aground]. 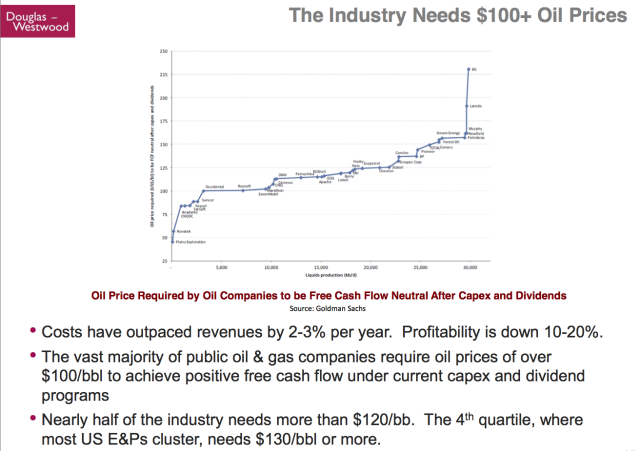 Hence the quagmire the shipping industry is sinking into. Within the industry, there’s a heated battle for market share between rail and trucking. Railroads, which are getting hammered by the collapse in oil and coal shipments, have been aggressively eating up market share. So far this year, the American Association of Railroads has been reporting strong growth in intermodal (container), the direct competitor to trucking. At the same time, DAT has been reporting the other side of the story. 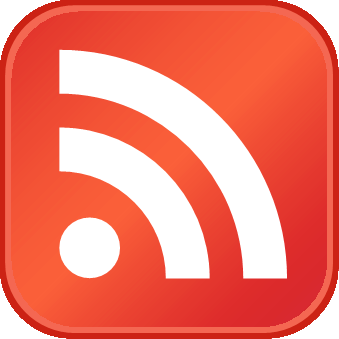 The transportation data provider tracks national spot market demand for trucks and available capacity via its load-to-truck ratio – “a sensitive real-time indicator” of the balance between the two. 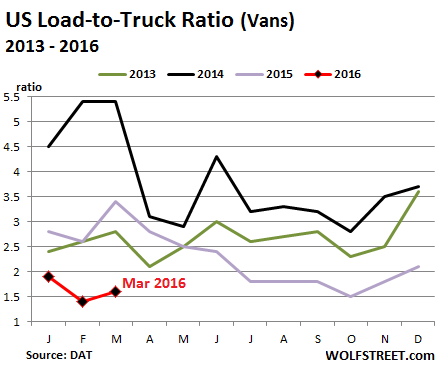 And in the spot market, trucking has turned from bad to awful. Which, ironically – this optimism despite reality for the past year and a half – is precisely why the inventory glut has reached such crisis proportion: a refusal to stare reality in the face, acknowledge what it is, and deal with it.